The Cadence® Protium™ FPGA-based prototyping platform is our second-generation advanced FPGA prototyping platform for early, pre-silicon software development, throughput regressions, and high-performance system validation. Expanding the Cadence Verification Suite, the Protium platform improves software development productivity, supports higher capacity, and facilitates faster bring-up compared to its predecessor and to other FPGA-based prototyping solutions. While FPGA-based prototyping is widely used today, with current prototyping tools, it can be both challenging and time-consuming to implement your design into an FPGA-based prototype. This is partly because you need to make some changes to the register-transfer level (RTL) design and also because there hasn’t been an easy transition available from an existing simulation or emulation environment to the prototype. The Protium platform, based on Xilinx Virtex-7 2000T FPGAs and featuring an advanced implementation and debug software flow, addresses these challenges. The Protium platform is the next generation of Cadence’s popular Rapid Prototyping Platform (RPP). Both platforms are compatible with the Palladium® XP verification computing platform, Palladium Z1 emulation platform and Cadence SpeedBridge®Adapters, facilitating a fast and smooth transition of an existing emulation environment into a high-performance rapid prototype. Step 1: Import and compile/synthesize the design. The Protium platform uses the Palladium integrated compile engine, which ensures compatibility with simulation and emulation and enables reuse of existing scripts, constraints, clock definitions, memory definitions, and much more. The output here is a netlist that’s optimized for FPGAs with ASIC memories already converted and mapped into FPGA memories. Step 2: Partition the design into multiple FPGAs. 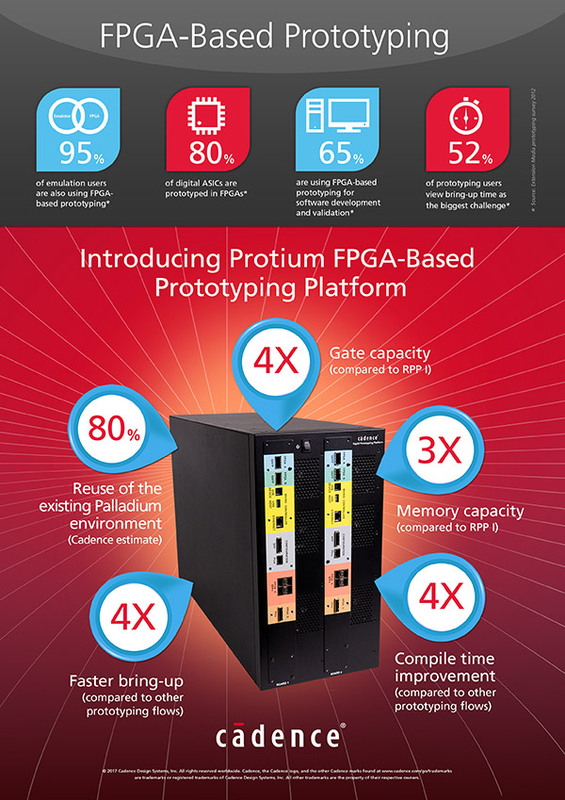 Here, the Protium platform will also convert gate clocks and latches into FPGA-friendly structures, address internal tri-states, add pin multiplexing between the FPGAs, and connect external interfaces, like PCI Express®, Ethernet, and more. This step generates one individual netlist per FPGA for subsequent place and route, as well as a verification model for validating design functionality before the time-consuming place-and-route step. Since debug and potential iterations to achieve prototyping functionality and performance goals are done before the place-and-route step, you can perform multiple iterations a day. Step 3: FPGA place and route to generate individual bit files for the FPGAs. Set-up for the place-and-route tool is handled automatically, which frees you from dealing with place-and-route constraints, switches, and time-consuming experimentation to get good results. The ability to use the same bring-up flow for Palladium emulation and Protium rapid prototyping allows our design teams to switch seamlessly between the two execution engines, which reduces the prototype bring-up time from months to weeks.